For cattle, horses, swine, sheep and other large animals. ALL NEW DESIGN FOR 2018! Get rectal temperature readings in 8 to 15 seconds, accurate to 1/10th of a degree. Choose from straight or angled probes and three different insertion lengths (2.0”, 3.0” and 4.0”) to meet your every measuring need. Probes are interchangeable; swap them out on the fly—no downtime or recalibration required! GLA thermometers are proudly built in the USA. SMALLER, LIGHTER, & EASIER TO-READ: Only 9.3 ounces and 2.7” x 1.5” x 4.3” in size. Hold by hand, rest on flat surface or carry on belt with optional leather holster. Features a large, backlit LCD for easy reading in bright or dim lighting conditions. Fast-acting probe gives you accurate readings in 8-15 seconds. Optional peak-temperature mode lets you know when to max temp is reached. 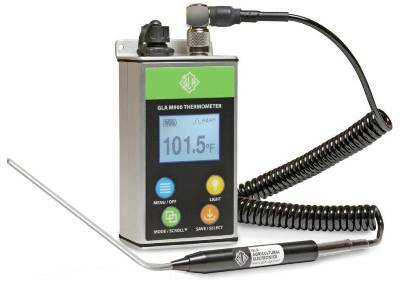 NEW EXTENDED-LIFE LI-ION BATTERY: GLA thermometers come with a extended-life Lithium Ion 4.5V battery and standard USB 110-220 VAC, 50/60 Hz wall charger. Power-saving auto shut-off after 5/15/30/60 minutes. Peak temperature hold with visual indicator, F/C switchable, continual recharging, battery strength display; probe error and low battery warning. SAME TOUGHNESS & DEPENDABLITY: Sturdy, machined aluminum case with anodized finish features EPDM seals for dependable weather and water resistance. Knobs and connectors are protected to prevent damage. Thermal probe is 304 stainless steel with anodized metal handle. Heavy-duty, coiled probe cable reaches 6 ft. WARRANTY: Thermometer 2 years, probe 1 year. Qualified repair and calibration service is available. IN THE BOX: One M900 digital thermometer; one M207R thermal probe (customer-selected), one USB wall charger; instructions, Optional leather belt holster, if specified. Click “Add to Cart” now and start measuring livestock and companion animal rectal temps with the newest, most advanced digital thermometer available today. Your satisfaction is 100% guaranteed. Get rectal temperature readings in 8 to 15 seconds, accurate to 1/10th of a degree. Choose from straight or angled probes and three different insertion lengths (2.0”, 3.0” and 4.0”) to meet your every measuring need. Probes are interchangeable; made to swap out on the fly—no downtime or recalibration required. Only 9.3 ounces and 2.7” x 1.5” x 4.3” in size. Hold by hand or rest on flat surface. Large, backlit LCD for easy reading in bright or dim lighting conditions. Fast-acting probe gives you accurate readings in 8-15 seconds. Optional peak-temperature mode lets you know when to max temp is reached. Sturdy, machined aluminum case with anodized finish features EPDM seals for dependable weather and water resistance. Knobs and connectors are recessed to prevent damage. Thermal probe is 304 stainless steel with anodized metal handle. Heavy-duty, coiled probe cable reaches 6 ft.
GLA thermometers come with a heavy-duty Li-Ion battery USB wall charger. Power-saving auto shut-off after 5 minutes. Peak temperature hold with visual indicator, F/C switchable, continual recharging, battery voltage display; and probe error and low battery warning. Thermometer 2 years, probe 1 year. Qualified repair and calibration service available. The GLA M700 Livestock Thermometer is used on ranches, dairies, cow-calf operations, commercial feedlots, veal units, swine farms, horse farms, game preserves, zoos, universities and veterinary practices for taking fast, accurate rectal temperatures of cattle, horses, and other farm and exotic animals. Weighing only 9.3 ounces and compact enough to hold by hand, the GLA M700 livestock thermometers are designed and built to take the abuse of daily use on commercial dairies, ranches, feedlots and veterinary practices. The thermometer’s inner electronics are protected by a heavy-duty, aluminum case and all exterior knobs and connectors are recessed within an equally sturdy protective bezel. GLA Thermometers feature a 1.5 x 1.0” backlit LCD for easy reading in bright or dim light conditions, peak temperature hold, F/C switchable, automatic shut-off, continual recharging, battery voltage display; and low battery warning. Every GLA M900 thermometer boasts fast rectal temperature readings in 8 to 15 seconds and measuring accuracy to 1/10th of a degree. Six different thermal probes are available to meet your measuring needs. 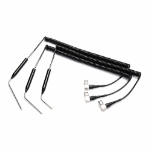 Probes are straight or angled and have a maximum insertion length of either 2.0”, 3.0” and 4.0”. Probe shafts are high-grade 304 stainless-steel fitted to an impact-resistant, anodized, metal handle. A heavy-duty vinyl-coated coiled cable connects the probe to the thermometer. The cable stretches a full six feet, affording plenty of reach and flexibility to accommodate even the most restless of animals. A stainless-steel BNC connector with knurled collar insures a secure probe connection while making attaching/detaching quick and easy. The thermal probes comprising the GLA M207 series are completely interchangeable. Probe change-outs can be made on the fly with no need for recalibration. The choice of straight or angled probes and three different probe lengths affords you the perfect probe design for virtually any animal. The GLA M900 thermometer package includes a heavy-duty M900 digital thermometer, a M207 series thermal probe on flexible coiled cable, USB charger with 110VAC adapter and instructions -- everything needed for taking fast, accurate livestock rectal temperatures right out of the box. Designed specifically for use with cattle and other types of large animals, its solid construction and quality electronics provide dependable, accurate temperature measurements over a long service life. Every GLA M900 thermometer is warranted for two years and should your thermometer ever require it, GLA Agricultural Electronics offers fast, expert repair and calibration service. Family-owned GLA Agricultural Electronics focuses all of their engineering and production expertise on a single product line—the GLA Livestock Thermometer. Designed to be durable, repairable and suitable for use in extreme conditions, every GLA Thermometer is carefully hand-assembled and tested in their San Luis Obispo facility. Since 1969, farmers, ranchers, veterinarians and researchers the world over have trusted GLA thermometers to provide fast, accurate information about the health and well-being of the animals in their care.